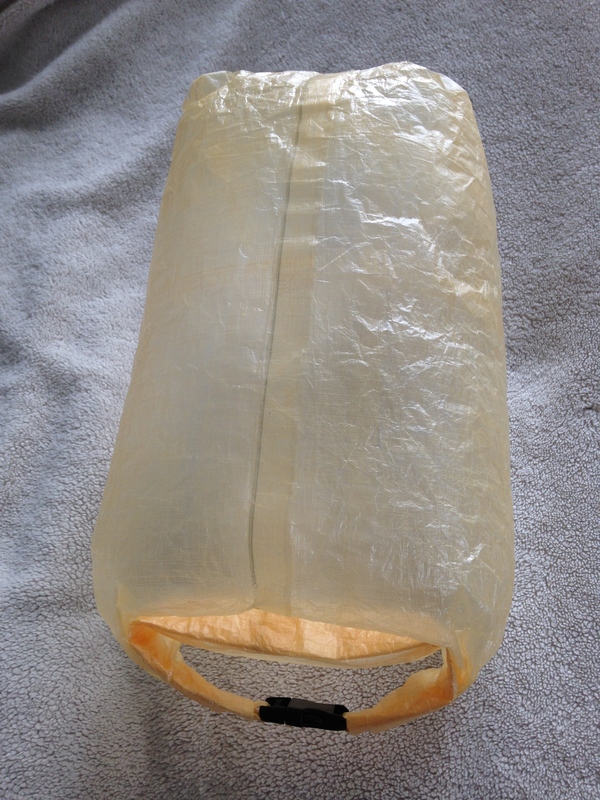 First ultralight gear made: dry bag! 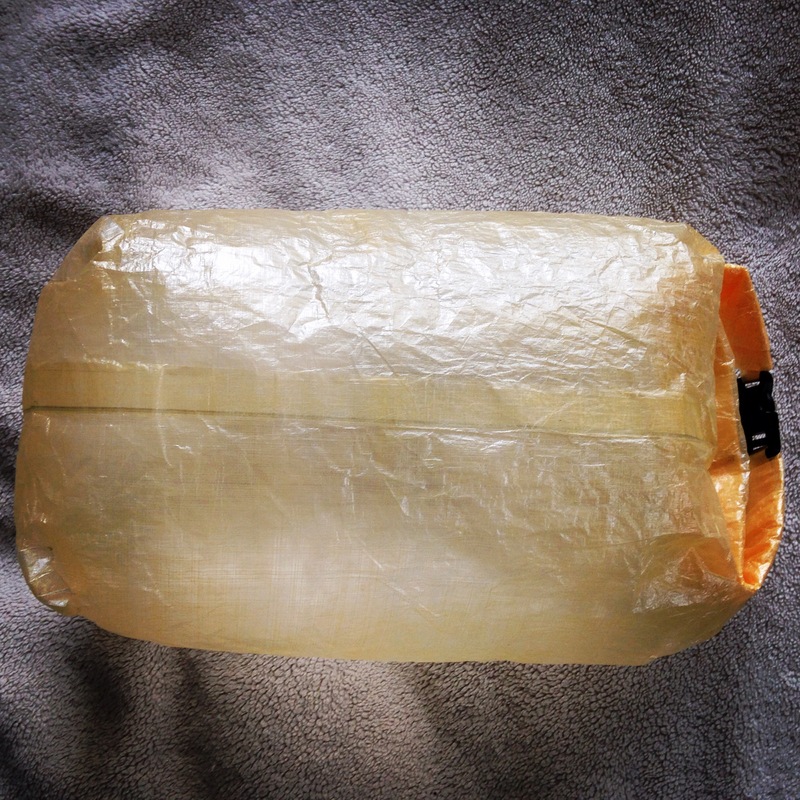 Gear: 8-Liter 0.33 oz/sqyd Cuben Fiber Roll-Top Dry Sack. Use: Dry bag for quilt, clothes, or small sleeping bag. In case you haven’t figured it out yet, this post is about gear making (Aka MYOG, or Make Your Own Gear). I confess – I haven’t been in the mountains much lately. Instead of hitting the hills, I’ve been climbing indoors at Vertical World, running (including a hilly 5k in Interlaken Park), and making gear for my next adventure! Yes, I’ve officially caught the ultralight bug. This is my first piece of ultralight gear – a Cuben fiber roll-top dry sack with the lightest possible cuben fiber out there (at 0.33 oz/sqyd). In short – ultralight, ultra strong, and waterproof. Perfect for tents, tarps, dry bags, stuff sacks, etc. It comes in weights ranging from 0.33 oz/sqyd-1.43 oz/sqyd plus as a hybrid with other materials. 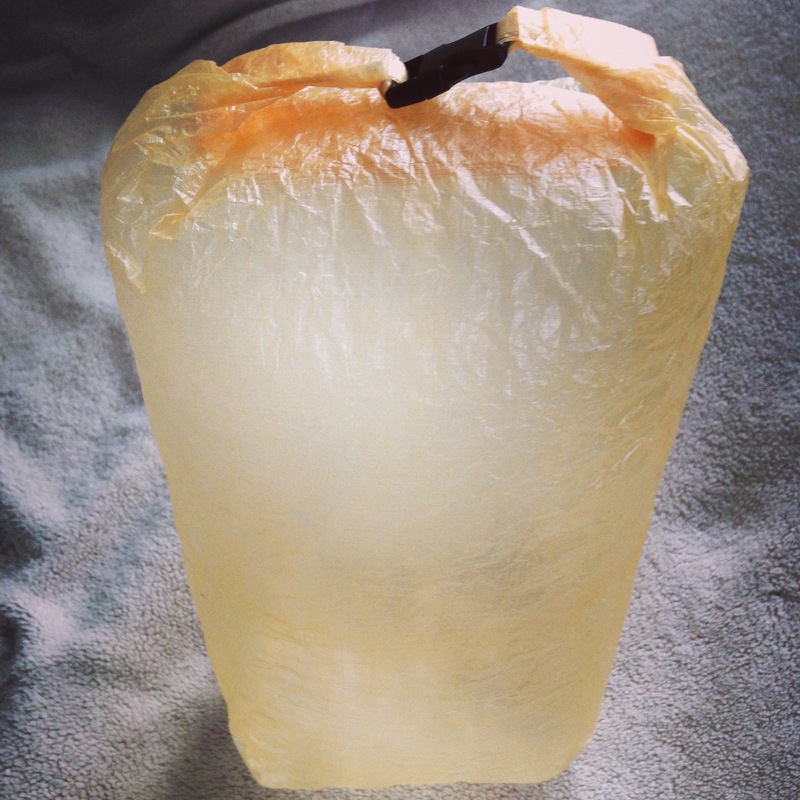 This dry bag is constructed with the lightest possible cuben – 0.33 oz/sqyd. Most of the seams are taped with double sided cuben tape. I folded the bottom and sewed the corners in order to get a box like shape, then taped the outside with single sided cuben tape for waterproofing. The top edge is reinforced with more 0.33 oz/sqyd cuben rolled/folded over, then taped with single sided cuben tape on which a buckle is attached for closure. It works well and will hold a small quilt. Because it is so likely to puncture, I consider it highly water resistant as opposed to fully waterproof. In fact, upon testing (filling with water! ), there were a few teeny tiny holes through which water seeped over time. It should function well inside a pack in rainy conditions, but probably not fully submerged in a river (which I don’t intend to do).